On the occasion of the 5th Anniversary of the OUBEY MINDKISS Project, the internet journalist Ulrike Reinhard did an interview with Dagmar Woyde-Koehler, initiator and curator of this project – via Skype from Hong Kong to Karlsruhe. It´s about processes of development and change, special experiences but also on some first ideas for the future, of course. If you would like to meet Dagmar Woyde-Koehler in person and talk to her, you can do so if you join the 5th Anniversary Happening of OUBEY MINDKISS at ZKM Karlsruhe between 2 and 10 pm. 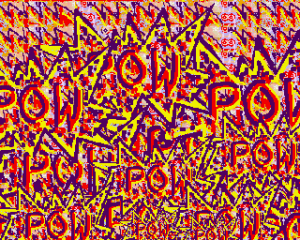 By the way: Every guest will have the chance to win the large sized high glossy version of OUBEYs PhotonPainting “POW” – which is the artistic counterpart of the map of “The Expanding Universe of OUBEY MINDKISS”. It´s a symbol for the explosive power of OUBEYs artwork and the expanding impact of the OUBEY MINDKISS project, spreading curiosity and interest in OUBEYs art all over the world. The modular USM Haller furniture system is famous around the world. Stellen Sie sich vor, ein unbekannter Mensch schickt Ihnen eine E-Mail, in der er Sie einlädt, sich vor laufender Kamera zu einem unbekannten Bild eines Ihnen nicht vertrauten Künstlers zu äußern – mit der Perspektive, dass die Videoaufzeichnung dieser Begegnung später im Internet veröffentlicht wird. Wie würden Sie reagieren?